The 21st edition of FIFA world Cup will take place in Russia from June 14, 2018 to July 15, 2018 so there will be 32 days of exciting football matches waiting for you. FIFA World Cup takes place every 4 year and the last world cup was hosted by the South America country Brazil. There were many requests from users for providing 2018 FIFA World Cup Schedule in Arabia Standard Time and so here we are with that. The Arabia Standard Time is used in many Middle East Countries such as Bahrain, Iraq, Kuwait, Qatar, Saudi Arabia and Yemen. As Saudi Arabia is also a part of the 32 teams that qualified for the 2018 FIFA World Cup, fans are excited for the complete match schedule as per Saudi Arabia Time. We know there are a lot of football crazy fans in Bahrain, Iraq, Kuwait, Qatar, Saudi Arabia and Yemen and they want to enjoy the FIFA World Cup 2018, but as the world cup is in Russia there will be a slight bit of difficulty in finding the match timings. 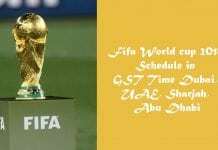 So here we are for you, we will provide you the Match Schedule of FIFA World Cup 2018 in Arabia Standard Time (AST) for all the 64 matches so that you never miss a match. Russia is a country with many different time zones. The Matches in Russia will be played as per UTC+2, UTC+3, UTC+4 & UTC+5. The Arabia Standard Time is UTC+3:00 hence we converted the timing of all the matches in UTC+3:00. 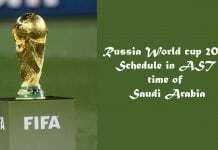 The Opening Match will be played on June 14, 2018 at 06:00 PM Arabia Time between Hosts Russia and Saudi Arabia at the Luzhniki Stadium in Moscow while the final match of the 2018 FIFA World Cup will be played on July 15, 2018 at 06:00 PM Arabia Standard Time. The greatest footballing extravaganza on the planet, the 2018 FIFA World Cup is fast approaching, and the fans cannot wait to see their country perform on the biggest of the platforms. Russia, the host nation for the quadrennial event has left no stone unturned in its preparation and is monitored closely by FIFA. India, as we all know closely, follows this mega footballing event and is set to be a major contributor to the TV viewership of FIFA World Cup. 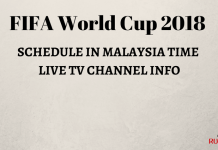 Hence, in order to assist the fans be in the know-how of when and where their favourite team is playing, we present to you FIFA World Cup 2018 schedule. The FIFA WC2018 timetable includes the fixtures, venue details, match timings in IST to add to the football madness. You can also download the FIFA World Cup 2018 schedule, timetable and team details in PDF or JPEG format. Once the teams are finalized in each group after the final draw you will be able to download the Match Schedule in PDF which you can save on your computer to check the timings. The other thing you can do is bookmark this page in your browser. The above schedule is helpful for fans from Bahrain, Iraq, Kuwait, Qatar, Saudi Arabia and Yemen as they also have same time zone i.e. UTC+3:00. Please share this article with your friends and family.